5. What should you eat for proper pH levels? The strongest evidence in support of maintaining an acid-alkaline balance relates to osteoporosis. "Consider that Americans consume more calcium-rich dairy foods than almost every other nation, and we have one of the highest rates of osteoporosis," says Cordain. "There's a disconnect here. Dairy may be rich in calcium, but most dairy foods also produce an acid yield." Susan Brown, Ph.D., who heads the nonprofit Osteoporosis Education Project in East Syracuse, N.Y., frames the acid-alkaline issue as one of mineral adequacy and depletion. "It's a little like over-farming and depleting mineral levels in soil," she says. "If we eat foods that create an acidic pH in the body, we will deplete our bones of minerals and our muscles of protein. Brown described a client named Janet whose doctor diagnosed her at age 52 with osteopenia, a demineralizing of bone that often foreshadows osteoporosis. At 55, Janet began following Brown's recommendations for eating more fruits and vegetables, taking supplements, and exercising. Three years later, Janet was clearly building bone mass in her spine and hip, even while going through menopause. Meanwhile, Sebastian acknowledges that he may have only scratched the surface when it comes to the health problems related to mild life-long acidosis. He says low-grade acidosis increases insulin resistance, the hallmark of both prediabetes and full-blown type-2 diabetes. It increases the risk of kidney stones and kidney failure. And one study suggests that it might even alter gene activity and raise the risk of breast cancer. He admits that no one yet knows all the consequences of a fundamental shift in the body's acid-alkaline balance, but he suspects it's far reaching. Millions of women dutifully take calcium supplements to help maintain their bone mass and reduce their chances of developing severe osteoporosis with age. But do supplements have any real benefit in alkalizing the body? Brown does see a benefit from supplements, but she says it's important to stem calcium and magnesium losses from acid-yielding eating habits. 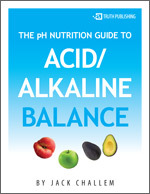 "Acid-alkaline balance is overwhelmingly a food issue," she emphasizes. "Your pH is really a sign of how your body is managing your mineral reserves." Potassium has turned out to be a crucial mineral for maintaining bone. High-potassium diets -- that is, those rich in fruits and vegetables -- slow bone loss, mainly by promoting alkalinity. So do supplements, such as potassium citrate and bicarbonate. While potassium citrate is commonly sold, the bicarbonate form is available only on prescription. Still, it's hard for supplements to compete with the potassium in foods. A handful of raisins, two dates, or a small banana each provide more than 300 mg of potassium. If you take supplements, opt for the citrate form, such as calcium citrate and magnesium citrate. (Potassium supplements must by law be under 99 mg because of a risk of arrhythmias at high doses.) Fumarate, aspartate, and succinate forms of minerals also have an alkalizing effect, and all get Brown's blessing. In one study, Sebastian found that potassium citrate supplements protected against calcium losses, even when people ate a high salt diet. Buffered vitamin C, which is ascorbic acid formulated with the carbonate forms of calcium, magnesium, and potassium, might also have a slight alkalizing effect. Some supplements, such as coral calcium, have been promoted as a way to restore an alkaline pH. But coral calcium is largely calcium carbonate, which is far less expensive as a generic supplement. It's also not as well absorbed as the citrate form.